Colony‘s Sarah Wayne Callies talks to Fan Fest about her directorial debut in season 3 and wonders if creator Ryan Condal is a time traveler. The popular dystopian sci-fi drama returns to USA Network for season 3 on May 2nd with Sarah Wayne Callies playing Katie Bowman, a rich character rooted in family and the fight for freedom from the RAPs. Katie’s family escapes the Los Angeles Bloc at the end of Colony season 2 with the oft duplicitous Alan Snyder in tow. Fans are anxious to see how the dynamic between the Bowmans and Snyder will play out as they exit L.A. The Bowmans are on a mission to deliver the gauntlet to the Resistance movement outside the wall, and Snyder claims he no longer wants to be a “rat”. However, Alan appears to be activating some sort of tracking device as the group drives away. Have we ever really been able to trust this guy? While we have many questions going into Colony season 3, it is definitely heartwarming to see the Bowman family intact for a change. One or more Bowmans has been missing at the start of each of the first two seasons and we can only hope that the tide is turning in favor of our protagonists. 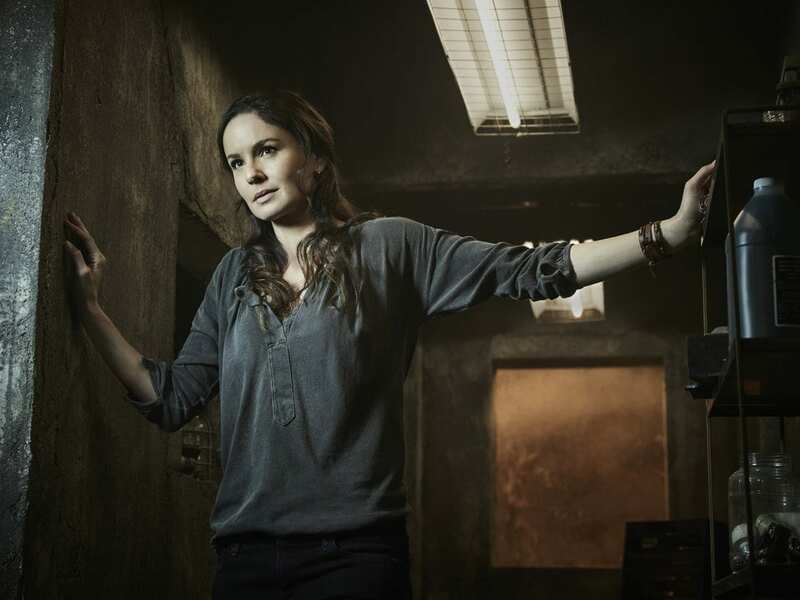 Sarah Wayne Callies shares some fascinating intel on the season ahead. She also provides some unique insights upon making her directorial debut on Colony this season. Plus, there is the matter of Josh Holloway’s haircut! Sarah: Oh, “home sweet home”. For sure. Yeah, the Bowmans are in a really, really good place at the beginning of the third season. Okay, I like that, but I have a feeling that might not last so long, based on some other things we’ve read and heard. Sarah: Not so long, but any moment of peace and love and joy you get on this show, I’ll take. Exactly! That kind of leads into my next question. What is it like for Katie starting this season with her whole family together for a change, as opposed to one or moe of the kids missing? Sarah: You know, it’s really interesting. On the one hand there is this really kind of wonderful Little House on the Prairie frontier living that’s going on, but there are two caveats. One is that, there is somebody living with them who is not a member of the Bowman family. And having Snyder around, I think, is a constant reminder that no matter how good things may be at home, there is the rest of the world to think about. That other caveat is that her sister isn’t there. And I think that there’s this huge question mark in Katie’s heart, about where Maddie is, and how she’s doing, because . . .
. . .the only thing Katie knows is that Maddie was shacked up with Nolan, and he’s a powerful guy in the IGA, but the L.A. Bloc is set for rendition. So, I think part of her really wants to believe that Maddie’s a smart and wily girl, who will have gotten herself into the safest of all possible situations. But that’s partly because Katie didn’t watch the end of last season, and she doesn’t know that Nolan abandoned her. I’m glad that you reminded us of that because it’s easy to forget sometimes that all the characters don’t know everything we do. That’s a really a great point. You mentioned Snyder. Fans continue to be suspicious of Snyder’s intentions. As different as he and Katie are, can you think of any characteristics the two of them have in common? Sarah: I think they really do both truly believe that they’re making the right decisions, not only for themselves, but for humanity. At least at the beginning of the season, I think Snyder really is a true believer, that collaboration was the best way to save the largest number of lives. And Katie, of course, has a completely different perspective. I’ve never been, I don’t think, as proud of a season of television as I am of this. It’s a really remarkable year. And Snyder’s journey is just fascinating. I think the writers have done a really remarkable job of kind of twisting, and perverting, and challenging, and humanizing him. Because it would be easy for him to just be “Snidely Whiplash” [of The Rocky and Bullwinkle Show], but they have turned him into someone much more complicated and much more interesting. Sarah makes her directorial debut this season on Colony. She will also take a turn directing part of the upcoming miniseries Unspeakable, in which she is cast as well. We took a moment to talk about both. What were some of the highlights of making your directorial debut on Colony this season? Sarah: Oh man, it was so moving. The simplest way to put it is that it was an honor. The writers and creators very smartly, I think, gave me an episode that was not as heavy on special effects and stunts, because those are very much things that I’m still learning about as a director. What they gave me ended up being the most intense acting episode that I think we’ve ever had. And so I got to work with these actors, who I know and love so much as friends and colleagues. And I got to work with them through these scenes that were so, just so intense, and so powerful. And they were so incredibly generous with their work. I think it’s some of the best work that Josh and Peter have ever done on the show. It was really breathtaking to be there and watch it. Things get pretty hysterical when Sarah goes on to talk about Tory Kittle’s reaction to her directing. Sarah: The funny part of it was that we’ve all known each other and there’s so much love there, that everybody was really, really open to everything, except of course Tory [Kittles]. I said “Alright then, well you let me know when you’re ready.” And I walked away. He said “Well, I’m just trying to treat you like any regular director, you know, I’m trying to give you the respect and the behavior. I’m not trying to give you any special treatment or whatever. And he gave me this look like it had never even occurred to him. That’s hilarious, oh my gosh! They are all such great actors, but I suspect you brought out the best in them, so I’m really looking forward to seeing that. There has been a lot of chatter online about Josh Holloway’s shorter hair in the season 3 trailer. And now you’ve changed your hair a little for your role in Unspeakable. First, how do you explain the fascination with Josh’s hair, but mostly what can you tell us about the miniseries Unspeakable? Sarah: Well, I think the fascination with Josh Holloway’s hair, is just the fascination with everything about the way Josh Holloway looks. In a way, my heart goes out to the guy, because he’s a really talented actor, and he’s a lovely human being. So much of the conversation around him has to do with the fact that he also happens to be drop dead gorgeous. It certainly changed the way he looked in ways that I think are really interesting. And it became a symbol of a new Will Bowman. But I don’t think it was meant to be that. I think he just wanted a bloody haircut. For Unspeakable I have an episode I’m directing in that as well, which is an honor and I’m so excited and proud to be a part of that, and to be adding my name to the roster of women directors out there. Unspeakable is a really personal story for the show runner and creator, Robert Cooper. It has to do with the Canadian blood scandal in the 80’s and kind of going on to the 90’s, when elements in the Canadian government and Red Cross made decisions not to treat and screen the blood in the blood banks, even though there was growing evidence of contamination with AIDS and hepatitis. So, in the interest of saving public funds, thousands of the public were infected with HIV and hepatitis C. It’s interesting because on one level, it’s a very local Canadian story, and on another level, it’s a reminder to all of us that we have to take responsibility for our own health system and our own government. Because when we just sort of say “Okay, well, I’ll just trust whatever they say, and I’ll do whatever they tell me” and when we lose our vigilance, as stewards of our own governments, that government often behaves in ways very, very dangerous to the public, in this case lethal. It’s an interesting time to be telling these stories. 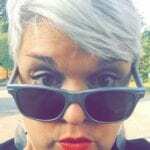 I was realizing the other day talking to Ryan [Condal] and Wes [Tooke] that we are really living in an age of resistance right now with the “Me Too” movement, and the “Black Lives Matter” movement, and the “March For Our Lives”. This is very much a story that explores the nature of resistance. It’s one thing to say “I’m going to stand up and take action.” Then there’s a whole lot of really important questions that need to be asked. Like, who do you stand with? And, what do you do when most people behave in ways that you don’t stand for anymore? There’s no better time to be telling this story, both of them [Colony and Unspeakable] actually. You must be so proud to be a part of such meaningful projects. I also watched The Long Road Home, and I was just completely captivated. And it just gave insights that most regular citizens never would have, into what happened in that situation and what our military families go through. You’re doing some really important productions. Not to minimize real life situations in any way, but in what ways might your work with the IRC (International Rescue Committee) inform your work on Colony, with the Bowmans essentially being refugees themselves, at the end of season two? I think the question of the work the Bowmans do, kind of as refugees, with refugees, it’s something that really touches me, that the writers brought that in so completely. It’s also become kind of accidentally, or not, I’m not sure, one of the ways in which this show is really sort of paralleling the real world. Which is to say, there’s a real conversation going on, about refugees in this world right now. And who deserves safety, and who deserves to be saved and protected and given asylum and who does not. And the Bowmans find themselves, Katie especially, very, very much a part of that conversation. This might serve as a little teaser for the season. We heard some talk at San Diego Comic-Con, about the phrase “The enemy of my enemy is my friend.” Is it fair to say the fight for freedom is about to get more complicated, or would you use a different word? Sarah: Well, the first thing that happens in season three is that we get answers to a lot of questions. The audience has been really patient, kind of learning along with the Bowmans, who are in the dark about a lot, because those things that are happening are kind of IGA and government level, not things they’re privy to. Sarah: I think the fight for freedom does get more complicated by the reveal that the RAPs are not the only extra-terrestrial society with their eyes on Earth. And, I think again, in the nature of exploring what resistance means, I think it’s very much in line with what’s going on right now. I think one of the questions of the season is why human beings are so unable to unite in the face of an obvious enemy. And what in the hell happened to the middle ground? The more intense things get, there’s a culture, both in Colony and in the global world right now. People are just, they’re leaning further right, they are leaning further left, they’re in-trenching, they’re not listening to one another. And that inability to live in the middle, and find that common ground, it’s literally breaking our cultures apart. And so that’s what we wrestle with kind of all season. I was reading all this Cambridge Analytica stuff and Breitbart and all of these nefarious forces that are mining our digital lives and manipulating us with it. The second half of the season is all about the ways in which people voluntarily surrender data, aggregated in a way, that is used to thwart and manipulate human lives. It’s crazy. I mean, there’s no way that any of us involved in the show could have known that this was about to land so fully in present time. I don’t know, maybe Ryan Condal is a time traveler. It’s happening every season with these parallels coming up. It is jaw-dropping. What fascinating information we gleaned from Sarah Wayne Callies on the new season of Colony! May 2nd cannot get here soon enough. We continue to wish Sarah the best in all her projects and her new found love of directing. We are grateful for her taking time to talk with Fan Fest and getting us even more excited for Colony‘s return.